Kim Kardashian has broken her silence on the Tristan Thompson scandal, following allegations he cheated on her sister, Khloe, while she was pregnant. 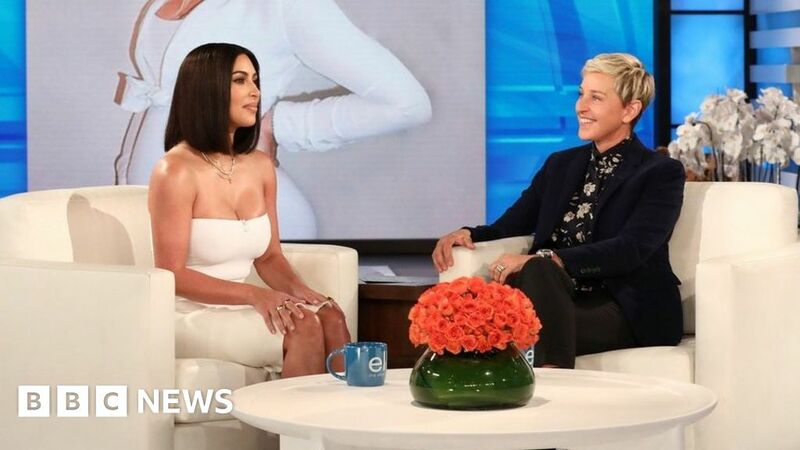 The star appeared on Ellen DeGeneres’s talk show on Monday night, also revealing she and Kanye had a difficult time agreeing a name for baby Chicago. In a wide-ranging interview, they covered a range of topics, including Kanye’s tweets, red carpets and Kimye house rules. Kim was the first of the Kardashians to openly comment on the reports that Khloe’s boyfriend Tristan cheated on her sister while she was pregnant with their daughter, True. “I don’t even know how to describe it besides it’s just so [messed] up,” Kim said about the situation – using a slightly stronger word than messed. Kim looked like she wanted to say more but refrained. Despite rumours that Khloe had forgiven Tristan, Kim said her sister was taking some time to try to work out what to do. “She wants to have some alone time with the baby and figure out what her next steps are,” Kim said. “I think it must be so hard to have your heart broken and fall in love all in a day or two – it all happening at the same time,” Kim added, referring to True’s arrival just days after the reports of Tristan’s cheating first appeared. With you in a mo’, just writing a quick tweet..
Perhaps the biggest shock revelation was that the Kardashian-West household has a no phones policy in place. “[Kanye] always talks about how we should not have our phones first thing in the morning. The queen of social media has no phone time? We all need to take note. Prior to their most recent arrival, Kim had told Ellen, she wanted a baby name with one syllable to match her other children North and Saint. But, somehow, she ended up with a three-syllable name. “It kind of messes with me, I’m not going to lie. I really like the one syllable thing,” Kim admits. “We were going to name her Jo, because of my Grandma, Mary-Jo. Or we were going to go with Grace…and we ended up with Chicago,” says Kim in a bewildered tone. She then goes on to say she’s unsure how the name Chicago even came about. The mother-of-three adds that she thinks the name is “cool and different”… but totally gets subbed down to Chi (pronounced Shy)…. “still one syllable,” she reassures herself. Being half of the one of the world’s most photographed couples, you think you’d have to love being in the limelight. Looking through a number of pictures of the two together, Ellen points out Kanye’s scowl, and refers to a conversation she had with him about how he doesn’t seem to smile in public. According to Kim, it’s to do with a dislike for press events. No man who waited three hours for his wife to get ready is ever going to smile. “I’m really, really, really good,” she says of her upcoming appearance on the US equivalent quiz show Family Feud. She also reveals she was obsessed with the show as a teen, saying she watched it in her father’s office when she was supposed to be working. Speaking about the birth of the couple’s latest baby, Chicago, Kim described using a surrogate mother as the “best experience”. Kim revealed she had her sister, Kourtney – and NOT her husband – with her at the birth for support. Kanye was in the next room “playing Connect 4 with his friends”. Natch. “It’s his favourite game – he’s the best at it,” she adds. Connect 4? Really? Is it even difficult to be good at it? Kanye recently rejoined Twitter – and don’t we know it. The rapper hasn’t wasted any time using the platform to sermonise and spread the (somewhat cryptic) Yeezy philosophy. “I didn’t even know he got his Twitter again – until I started seeing tweets come in from other people, retweeting them,” Kim said. She decided to do the decent thing and follow him back. After all, he needs to get his follower count up. Asked about the meaning of some of her husband’s tweets, however, Kim admitted she was at as much of a loss as the rest of us. “I was very confused about that one,” Kim admits. “What did he mean?” asks Ellen. “I don’t know… it didn’t mean EVERYTHING,” Kim says, with slight uncertainty in her voice. “But you live with him…” persists Ellen. “Yeah, it didn’t mean me…” she says. Hmmm – let’s hope so…. With Chicago she is getting “better”. Kim describes her “shock” when the day before the interview, North offered to share her popcorn with Saint. As a parent, though, are you even allowed to say that? Kim admitted that the pair are big into going on holiday at the moment, and mused that it would be a nice idea to go somewhere for their upcoming fourth anniversary. Asked whether Kim would have a plane waiting and just surprise her husband, she waivered. Seems like a fair deal to us. That’s right. A two-year-old can spell a word you still have to use spellcheck for. “I’ve never seen a kid speak the way he speaks,” Kim says of her Yeezy protege. “He has such amazing vocabulary and I know it’s like such a Kanye thing to say, like, ‘Oh my kid’s a genius’, but if I’m saying it, it’s real,” she says, tongue in cheek. “I was very impressed,” she goes on. So are we, to be fair.